Her other Daydream's single "One Sweet Day" remained for 16 weeks at the top of the charts. She is the only artist since The Beatles to have so many #1 singles and albums. With "Heartbreaker", the first single from her 1999 album Rainbow and also her 14 #1 single, she became the only artist to top the charts in each year of the 1990s, and with "Heartbreaker" at its 60th week atop the Billboard's charts, she pushed ahead of The Beatles's 59-week record as the only artist with the most cumulative weeks spent atop Billboard's Hot 100 Singles chart. Following "Heartbreaker," her second single "Thank God I Found You" also from her Rainbow album became her 15th #1. "We Belong Together" from her 2005 album The Emancipation of Mimi became her 16th #1 single and was also her first #1 without any guest artists since her song "My All" (also a #1 single) captured the top spot in May 1998. The single "Don't Forget About Us" also from her 2005 album Emancipation of Mimi became her 17th #1 single, tying her with Elvis Presley's 17 #1 singles. Three more Grammy Awards were gained from The Emancipation of Mimi album. She is the most successful selling female artist in music history and is the only female artist to have the most #1 singles and albums and also holds the record for straight #1 singles and albums each year. Along with numerous awards and incredible vocal range, she also composes all of her own material, with the exception of song covers. In April 2008, the single "Touch My Body" became her 18th #1 single, pushing her ahead of Elvis Presley's 17 #1 singles. Now she is the only artist since The Beatles to have as many number one singles and the only singer alive likely to succeed them. Mariah Carey is an American singer-songwriter, record producer, and actress. She made her recording debut in 1990 under the guidance of Columbia Records executive Tommy Mottola, and became the first recording artist to have her first five singles top the U.S. Billboard Hot 100 chart. Following her marriage to Mottola in 1993, a series of hit records established her position as Columbia's highest-selling act. According to Billboard magazine, she was the most successful artist of the 1990s in the United States. Carey was named the best-selling female pop artist of the millennium at the 2000 World Music Awards. She has the most number-one singles for a solo artist in the United States (eighteen; second artist overall behind The Beatles), where, according to the Recording Industry Association of America, she is one of the best-selling female artists and sixteenth overall recording artist. In addition to her commercial accomplishments, Carey has earned five Grammy Awards, and is well-known for her vocal range, power, melismatic style, and use of the whistle register. She is ranked as the best-selling female artist of the U.S. Nielsen Soundscan era (third best-selling artist overall), with sales of over 62.5 million albums in the U.S. and has sold over 200 million albums worldwide. 17 certified hits including: Always Be My Baby - Dreamlover - Emotions - Fantasy - Hero - Honey - I Don't Wanna Cry - I Still Believe - I'll Be There - Love Takes Time - My All - One Sweet Day - Someday - Sweetheart - Vision of Love - When You Believe - Whenever You Call. 'There's a hero if you look inside your heart. You don't have to be afraid of what you are...' The strength of this message is fully supported by Carl's superb arrangement of Mariah Carey's blockbuster hit. The accompaniment CD is exceptional. Magnificent! This #1 pop hit from 1984 by Foreigner is one of the band's best known songs and remains an enduring radio favorite. 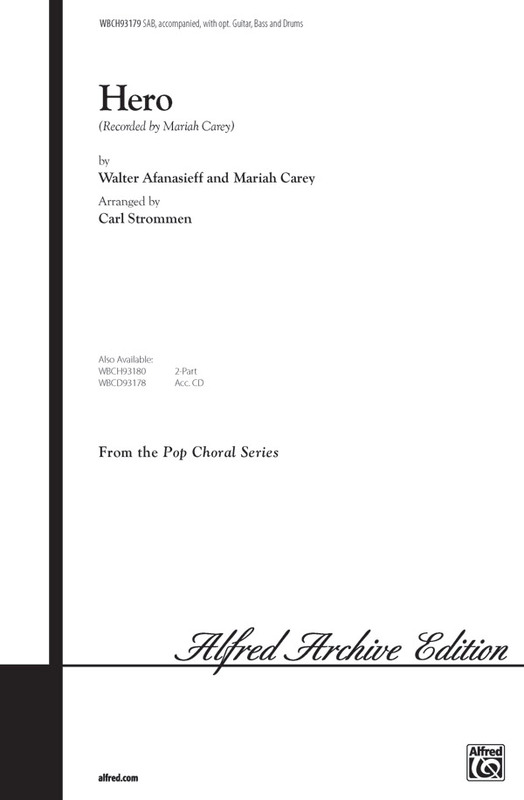 A new generation of fans embraced Mariah Carey's cover of the song in 2009, making it a fabulous programming choice for choirs of all levels! Available separately: SATB, SAB, SSA, ShowTrax CD. Combo parts available as a digital download (flu 1-2, tsx, tbn, syn, gtr, b, dm). Duration: ca. 3:30. Mike Taylor : Oh Santa! Featured on Mariah Carey's second holiday album Merry Christmas II You, here's one especially for the gals! Perky and jazzy! "Santa's gon' come and make him mine this Christmas!" Mark Brymer : Oh Santa! Mariah Carey rocked the Christmas house with this cute number that simply sparkles with nostalgia! Opening with a spirited holiday chant, the bubbly melody bounces over the fun vocal back-ups for an awesome pop choral showcase! Available separately: SATB, SAB, SSA, ShowTrax CD. Duration: ca. 2:45. The majesty and joy of Christmas resound in this inspirational work recorded by Mariah Carey on her Merry Christmas II You album from 2010. An ideal selection for Christmas concerts and worship! Available separately: SATB, SAB, SSA, ChoirTrax CD. Duration: ca. 3:55. A beautiful power ballad from the animated movie The Star. With a half time back beat feel and a melody that won't leave your thoughts, this is the sort of ballad that has an audience wondering where did that come from? Immensley singable with a melody that fits the voice beautifully.